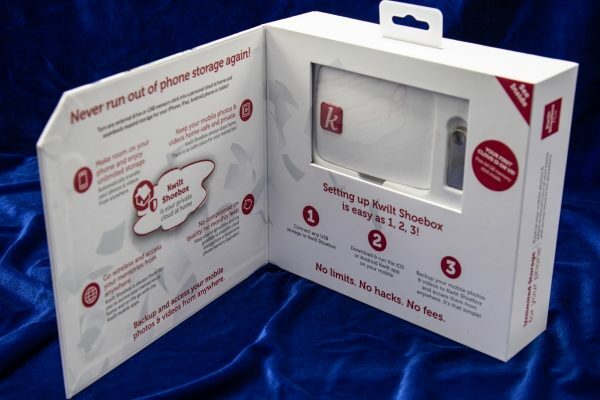 The Kwilt Shoebox Plus allows you to transfer/backup your photos and videos from your phone or tablet, and to have access to them and any other media attached to the shoebox from anywhere in the world and at any time, as long as you have internet access. 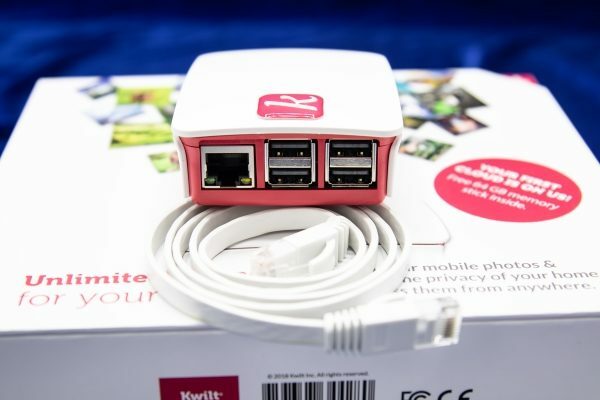 Much like the previous model, the Kwilt Shoebox Plus is a small and lightweight device that allows you to connect a relatively limitless amount of hard drive storage via its 4 built-in USB ports. You can transfer your pictures and videos from your mobile device to “free up” storage, or you can create a backup of your content. The device allows you to have access to the content from anywhere in the world as long as you have internet access and the app configured on your device. You can set up additional accounts for family and friends and others. 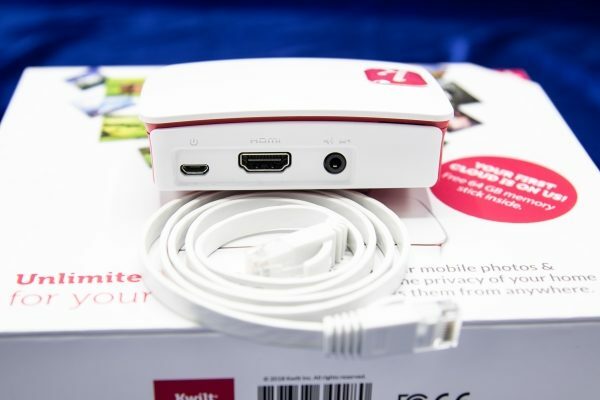 You can display the photos and videos on a display via the HDMI port and hear any audio via the audio port. On one of the long sides of this device, there are 3 ports. From left to right there is a power port, an HDMI display port and an audio out port. On one of the short sides of the device, there are 4 USB ports and an Ethernet jack. Once again, much like the previous model, the initial setup of the Kwilt was very easy right out of the box, with no issues at all. This time around, they provided a 64GB flash drive to get you started which as I stated in the first review, is simply amazing and a great gesture by the manufacturer. Since the app was already loaded on my devices, as soon as I connected the Kwilt Shoebox Plus to my network, it showed up as a second Kwilt in the app. (This time around, I connected the Kwilt via the Ethernet cable). 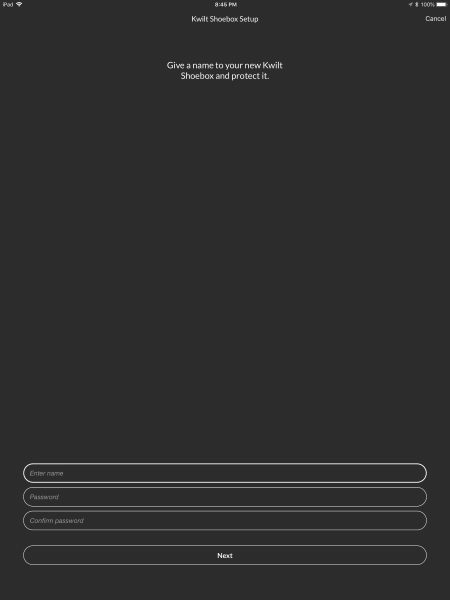 The instructions were easy to follow, and since I had already created an account for the first Kwilt, in a few seconds, all was set and ready to go. 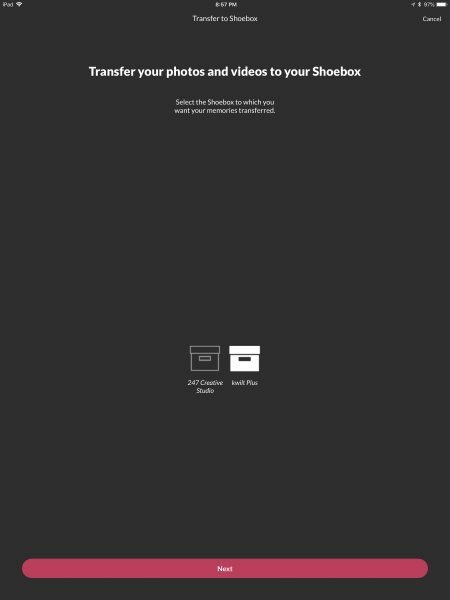 When I opened the app, the first screen asked me to create a name and password for the new device. Once I gave the device a name, (Unlike my first Kwilt, I just named this one Kwilt Plus), the next screen was the main screen with a thumbnail view of some of my photos/videos, and the icon in the upper left corner for the choices. First I selected Manage Kwilt Shoebox to see what the app showed for my devices. Once that selection looked good, I selected the choice to Transfer to Shoebox and both Kwilt devices were displayed for my selection. 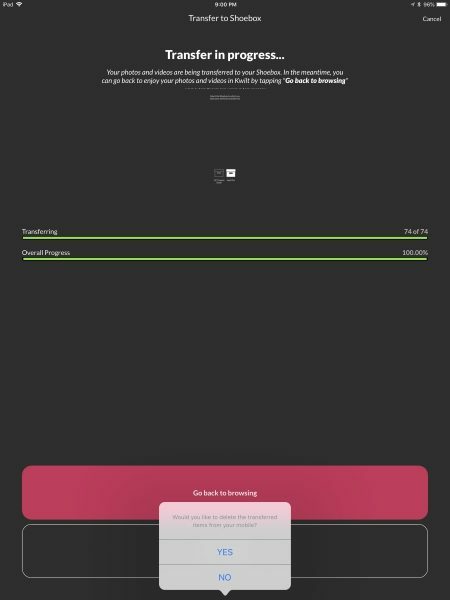 This time around, when I selected the Kwilt Plus option to transfer my photos and videos together, I had no problem with the app. I selected the option to transfer all files including both videos and photos, and the process was flawless. When I tested the first Kwilt, whenever my phone went into sleep mode, the app would stop the transfer. This time around, the phone stayed awake and successfully completed the transfer. All of the functions included in the original Kwilt Shoebox are also included in this version. 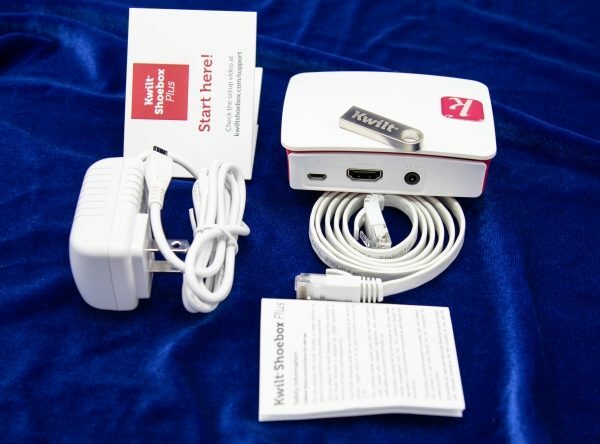 To see the review of the first Kwilt Mini Shoebox, click here: Kwilt Shoebox review. 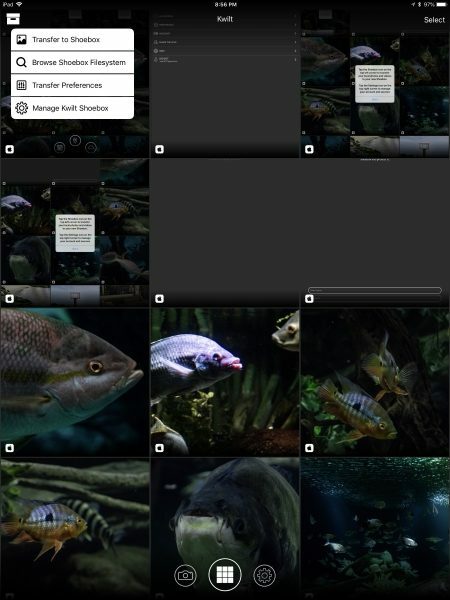 The KwiltKeys photo keyboard for IOS allows you find any picture and place it into any relevant app. The Kwilt for MS Office365 add-on allows you to find and insert any photos into Word or PowerPoint. The Kwilt for MS Outlook add-on that allows you to find and insert any photos into MS Outlook. The addition of wired Ethernet for this new model. The great improvement of the functionality of the app. The great improvement in the Customer Support function. The addition of multiple USB ports for flexibility and expansion. In my opinion, there is nothing to be improved. They got it right. 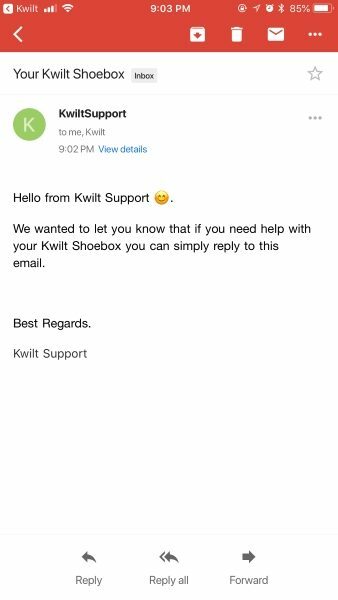 The Kwilt Shoebox Plus is a great improvement to the first model and continues to be a really nice device that is designed to perform a very useful and convenient function. Just like its predecessor, it provides for virtually limitless storage for your mobile picture and videos, far beyond the built-in storage capacity of any phone on the market today. It continues to allow access to others persons of your choice, and with a bit of imagination, it can be useful in more ways than mentioned in my review, including as an example, when you get a new cell phone and you are switching from say Android to IOS. 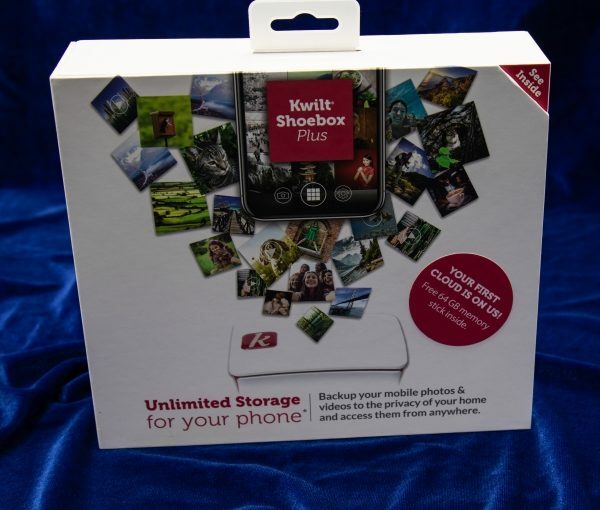 The Kwilt Shoebox Plus makes the process of safeguarding your priceless pictures and videos that are on your cell phone, easy and painless. I can’t wait to see what Kwilt comes up with next. In my opinion, this is a win. Where to buy: Kwilt Shoebox Website. I’m sorry but that is a Raspberry Pie 3 with a custom firmware. While the feature are pretty cool you can do the same thing with a hard drive connected to your home router. It is a raspberry 3+ indeed which is a very nice hardware playform. The hardware alone is good but it’s the software and the whole Kwilt infrastructure behind it that makes the solution amazing. Mentioning routers, Kwilt has built-in software in many routers including the Netgear Nighthawk family and some D-Link models as well. But if you don’t have one of those routers, the Kwilt Shoebox is your best bet for easily backing up and accessing your mobile photos privately from anywhere. Have to see the software. The hardware is not remarkable, but it doesn’t have to be. The entire POINT of the raspberry pi, is to provide a reliable, cheap, mass produced foundation for people to develop on. I myself have developed and marketed several of our products that were “just raspberry pi’s”. It allowed us to market an sell our product for About $100, where a custom board, case, etc, would have pushed our product up to $350. Unless of course we could order in batches of 500,000+. The proof is in the code. That is what needs to be evaluated, not the hardware footprint.